ALIAS(ES): Diane Danger, Artemis, Tigress. UNIFORM: Since taking on the Tigress identity full time, Artemis wears a burnt orange and black uniform. A hard, orange mask, looking like a stylised tiger's face, covers forehead down to her cheeks, and she wears a black belt to hold her weapons, along with a black sheath on her back to hold her sword. DESCRIPTION: Artemis stands at an average 5' 4" tall, and weighs 140lbs. However, this is 140lbs of solid, athletic muscle. Slim of build, her muscles are highly defined and well toned, and her shoulders - broad and well shaped - are a dead giveaway that she trains hard. Needless to say, she doesn't look particularly fetching in a sleeveless or strapless dress. Her blonde hair rests just below her shoulders, and her olive skin is the only real thing that hints at her Vietnamese heritage on her mother's side, the rest of her appearance being very much biased towards her father's looks. She has deep grey eyes, fringed by long lashes, and a smattering of freckles across her nose. However, when using the Glamour Charm, Artemis takes on an appearance closer to her mother: her features become almost typically Vietnamese, her hair deepens to a glossy black, and her eyes become fathomless pools of black. She has, however, decided that she prefers her own appearance after a long period of time using the charm, and is trying to reconcile the "old" Artemis with her new identity as Tigress. Fear: Losing everyone and everything she cares about. Desire: If you had asked her a year before, it would have been to retire in peace (again) with Wally West. Now? The only desire she would admit to would be wanting to eradicate evil from the world. HABITS: Artemis works hard to keep any nervous tics under control. She is almost obsessive, though, in her need to train and keep fit, and becomes anxious if she doesn't train daily. She is almost as obsessive over her studies, and is determined to - one day - qualify as a doctor, even though that means confronting some painful memories of her time living with Wally West. PET PEEVE: Intolerance. Artemis's upbringing and subsequent development as a member of The Team has left her with little time for those intolerant of the differences in others: give her a racist, sexist, or a homophobe, and she'd happily kick seven bells out of them, no questions asked. Marksmanship. Artemis is a highly proficient marksman with a number of weapons, including her comppound bow and a crossbow. She is able to hit tiny targets from long distances away, although her accuracy is better with the compound bow. Ambidexterity. She is equally as skilled at drawing her bow with her left hand as with her right, although she favours right-handed use. Tracking. Due to the trainined received by her assassin parents as she was growing up, Artemis is a skilled tracker of those attempting to evade capture. Acrobatics. While this is not her strongest area, she is proficient in basic acrobatics. Martial artist. Able to tackle and defeat multiple attackers with ease, Artemis is a hghly skilled martial artist, proficient in a number of disciplines. Intelligence. Of above-average intellect, Artemis was the recipient of a full scholarship to the Gotham Academy, and, in Palo Alto, was studying for a dual-major degree in biology and physics, with a view to becoming a doctor. Multilingual. Artemis is fluent in English. Vietnamese, French and Spanish. First aid. Artemis has shown herself to be proficient and resourceful in emergency first aid. Loyalty to her sister. Despite the fact that Cheshire is a villain, Artemis feels strong loyalty to her and her daughter, Lian. She would risk her own safety to protect either of them. There are some seriously conflicted emotions going on there. Wally west. Although, in her heart of hearts, Artemis knows that Wally is dead and gone, if there was the slightest possibility that he might - just somehow - be alive, she would feel bound to investigate, no matter the cost. TRAITS: Outwardly, Artemis is brash, aggressive and caustic, with a biting, sarcastic wit that flays those who go up against her. She has a wild and almost unpredictable temper, and needs little excuse to involve herself in conflict. However, her time in The Team has softened her somewhat, and those she trusts and cares for see a gentler side to her. Since Wally's death, Artemis has found herself needing those friends more and more, and is just now starting to let people back in. However, if threatened, she will hide behind her brittle shell of aggression. 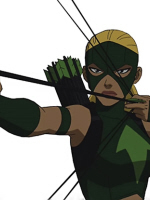 HISTORY: Born to assassin parents, Artemis Crock had a very unconventional upbringing. Raised in Gotham City with her elder sister Jade, her parents were active criminals under the names of Sportsmaster and Huntress. However, the family unit was broken up while Artemis was still small, after her mother took the fall for her father in one of their heists, becoming a paraplegic in the process, and went to jail for six years. Later that same year, Jade ran away due to their father's abusive behaviour towards, the girls, leaving Artemis behind. Lawrence Crock put Artemis through a gruelling and likely cruel training regime, teaching her to use a bow and arrow to a frighteningly high standard. However, learning this skill didn't come without its drawbacks, and, despite not being able to remember fully, Artemis has a strong belief that her father put her through several criminal tests, including being forced into killing someone. When her mother was released from prison, she told her father that she had gone straight, and wanted Artemis to do so as well, but Artemis overheard the conversation and ran away, heading into Gotham City in her green costume in order to fight crime. She was only fifteen years of age. She had been on her own for less than a month when she stumbled across members of The Team fighting in the halls of Gotham Academy. Staying hidden, she aided them, fighting off MONQIs and saving Kid Flash - whom she would later know as Wally West - from being crushed. Later visited by Batman and Green Arrow, she was recruited to The Team under the guise of being his niece and new sidekick. Ashamed of her criminal parents and her past, Artemis willingly kept the secret from her new friends for a long time, however, once she learned to trust her team mates, she shared her past without fear of being judged. The last six years have been a rollercoaster for Artemis: she played double-agent, she fell in love, had her lover sacrifice himself to save the planet, and now is back with The Team, trying to make a place for herself in the world. Thing is... Artemis is no longer sure what her place is. RP SAMPLE: The pleasing zing as the bowstring returned to resting, and the resounding thock as the arrow met its mark was music to Artemis's ears. Since taking on the mantle of Tigress, it had been a necessity to forsake her compound bow for a crossbow: after all, the compound bow was as much a part of her identity as her name, and, in order to succeed undercover, she had needed to eradicate as much of her previous identity as possible. Pulling another arrow from her quiver, she swapped hands, firing off a left-handed shot this time, pleased when it snicked in beside the other arrow, almost touching. She might be rusty, but she wasn't totally unskilled. Wally's death had unsettled her, and she had left behind portions of herself that she hadn't realised that she had missed. About to slot her bowstring into the groove on yet another arrow, a familiar voice snaked its way into her ear, and, a little startled, Artemis lowered her bow. "You know, for someone so big, you've got a light foot," she remarked, smiling slightly as she turned to face Conner Kent. "Anyone ever tell you it's rude to sneak up on a lady, especially when she's carrying a weapon?" The smile turned into a grin, and, for a second, she mock-lined up a shot on her friend's chest. "Catch that one if you can, Superslow!"